Figure 1. 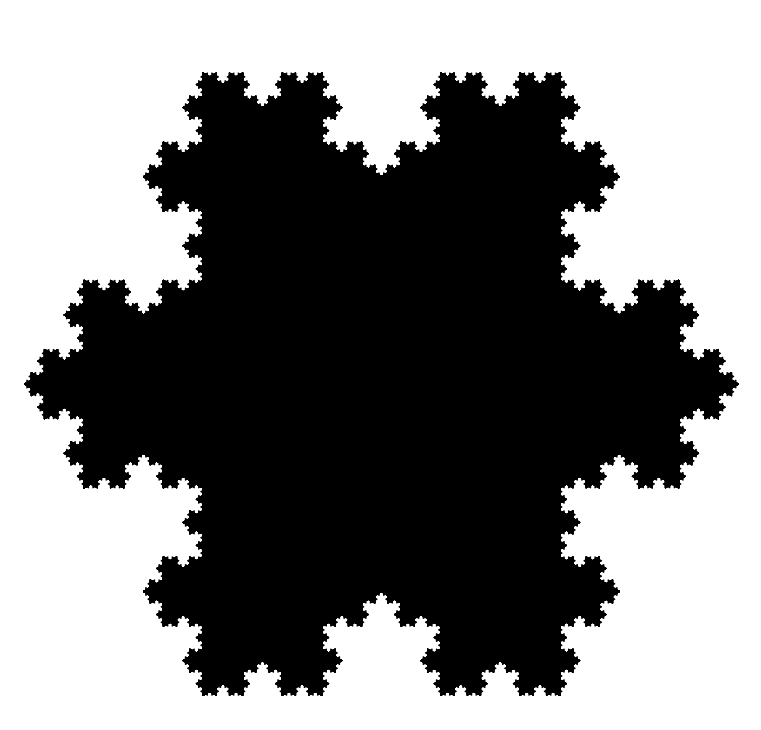 An approximation of the Koch Snowflake. An interesting property of the Koch Snowflake is that it has a boundary, or edge, of infinite length. (For another curve of infinite length, confined within a finite area, see the post on the Hilbert Curve.) The shape is constructed out of equilateral triangles. A picture showing an approximation of the Koch Snowflake is given in Figure 1; this is only an approximation, since the shape would be defined as the limit of the process suggested in Figure 2. For more detail on the mathematics of the construction, you might like to start with the references given below (Wikipedia 2013; Wolfram MathWorld 2013). Figure 2. 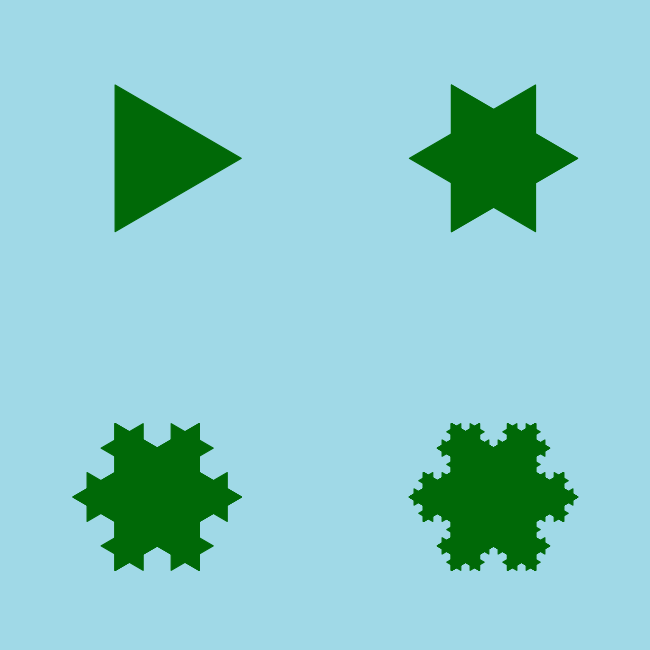 Iterations of the snowflake (or island, depending on the colour scheme). Figures 1 and 2 were produced using the functions provided in the R Script below. I’ve focused on drawing the images, rather than constructing the set of points that describe the fractal edge of the shape. My algorithm is inefficient in the sense that it computes many more triangles than required; also, the large number of conditional statements suggests that the number of lines of code could be reduced. The key concept is contained within a function that takes the vertices of a triangle as input, and which returns the vertices of a smaller triangle as output; this function is then called recursively. To find the vertices of smaller triangles, the new vertices are computed as linear combinations of the old vertices. Mandlebrot, B. 1967. How long is the coast of Britain? Science, 156 (3775), pp. 636-638. #Script by A. Roberts, 2013. #To run the script, copy and paste it onto the R command line, and press ,<enter>. return(Tnew); #Return a smaller triangle. Figure 1. 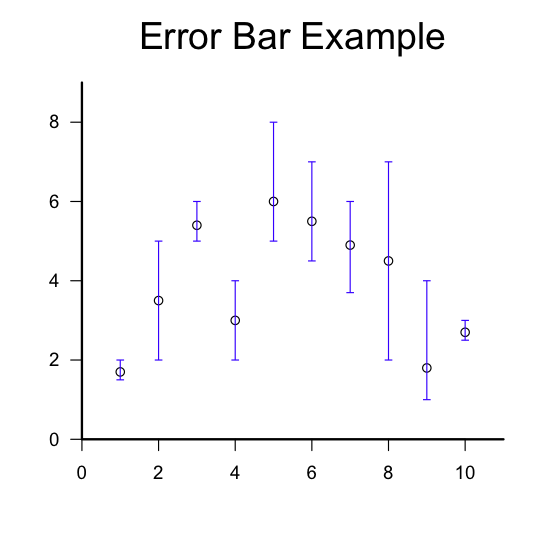 Example error bars. X = 1:10; #A sequence of the integers from 1 to 10, inclusive. Y = c(1.7, 3.5, 5.4,3,6,5.5,4.9,4.5,1.8,2.7); #Example values for y.
upper=c( 2, 5, 6, 4, 8, 7, 6, 7, 4, 3); #Upper limits for the error bars. lower=c(1.5, 2, 5, 2, 5, 4.5, 3.7, 2, 1, 2.5); #Lower limits. quartz(character(1),5,5); #Open a new graphics window on a Mac. par(usr=c(0,11, 0,max(upper)+1)); #Set the limits for the plotting window axes. axis(1); #Draw the horizontal axis. axis(2,las=1); #Draw the vertical axis. box(bty=letters, lwd=2); #Draw a frame around the plot. points(X,Y); #Plot the data points. 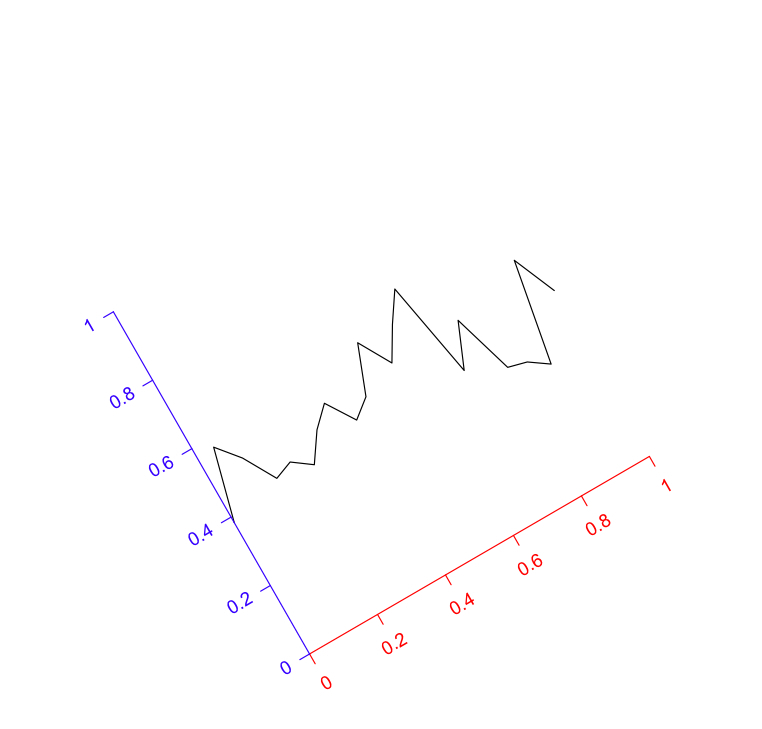 add.error.bars(X,lower,upper,width=0.2,col=rgb(0,0,1)); #Draw the error bars. Figure 1. 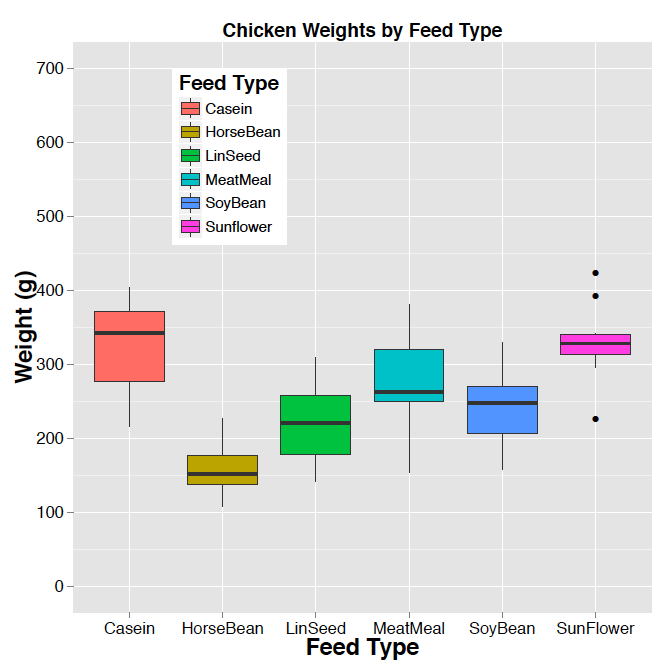 The workshop will likely focus on making data plots, and other R basics. Guest speaker Allan Roberts from Ocean Networks Canada will be presenting a workshop on R, a versatile statistics package that’s useful in the marine sciences and related disciplines. For a summary of recent data workshops which were held at UVic in July, click here. Figure. An example plot, made with the R graphics package “ggplot2”. Beginning to plot in ggpplot2 can be tricky at first; however, because of its growing popularity, there is a lot of support for it on R forums. Another useful resource is the R Graphics Cookbook (Chang 2013). You can run the script provided below by cutting and pasting it onto the R command line and pressing <enter>. #Note: after each change the the graph, entering “p” is required to view the new graph. #Wordpress prefers to use left and right quotes. Hence the use of the “quote” function. p #Viewing the plot. After each change the the graph, entering “p” is required to view the new graph. Last week, Dr. Isabelle Côté reminded us of the importance of R’s in science: That is, Reading, (w)Riting, and ‘Rithmetic, plus the ability to Relate your work to others. There is one final R, and that is… well R itself. R is statistical software that gives you a framework for analyzing, plotting, and ultimately understanding the data that you collect (you may be familiar with some of the more abstract uses of R if you read the blog regularly). Unlike most statistics programs, it is completely free, and is driven by a vibrant online community. If you pursue a career in science, the time will come where you need to use R. It is already the gold standard for biology, but is expanding into other disciplines as well (See this old but good article in the NYT). Aside from being free, R is ideal because it is infinitely expandable. It has a system where people can write mini-programs called “packages” that any user can download and install. These packages add features to R which range from enhanced graphing capabilities, tools for complicated analysis, or even software which turns R into a GIS engine (like ArcGIS). With this expandability, R-savvy scientists may never have to pay for data analysis ever again. However, for people with no background in programming (myself included) learning R can be a daunting task. It has no Graphical User Interface (GUI), so everything must be done using R’s scripting language. This is worth learning, and there are many great references including books (Intro to R), websites (Quick-R, Stack Exchange, R Gallery, and R-Bloggers) and online courses (http://blog.revolutionanalytics.com/courses/) to help with the process. If you aren’t ready to commit to learning a new language, you can still experience some of R’s power through the use of Deducer, a GUI package that turns R into a point-and-click stats program similar to SPSS (www.deducer.org). It is based on the powerful ggplot2 graphing engine, meaning that you can use this program to make beautiful figures without knowing anything about how the coding works. Deducer is no substitute for learning how to code in R. While it does basic plotting very well, you will find that you will be stuck with having to learn coding anyway as soon as you want to do anything outside of what’s capable in the GUI’s menus. However, it makes a great stepping-stone, and is more than enough for most analyses done in student projects here at BMSC. It is critically important for modern scientists to be comfortable with analyzing and plotting the data they collect. As biologists, we do these tasks in R, and that is unlikely to change in the forseeable future. Deducer makes R accessible, and is an excellent option for courses which require students to work with data they collect in their research projects. Figure 1. 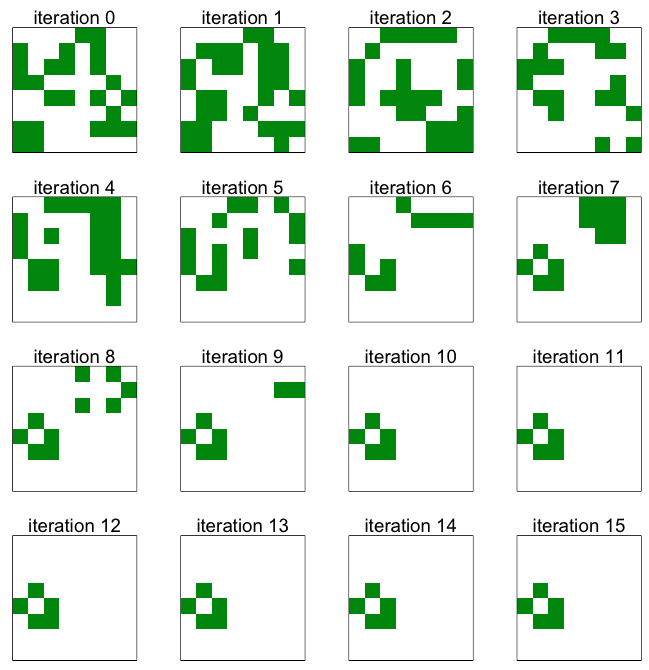 Several iterations of the algorithm, beginning from a randomly determined initial position. The R script provided below implements J.H. 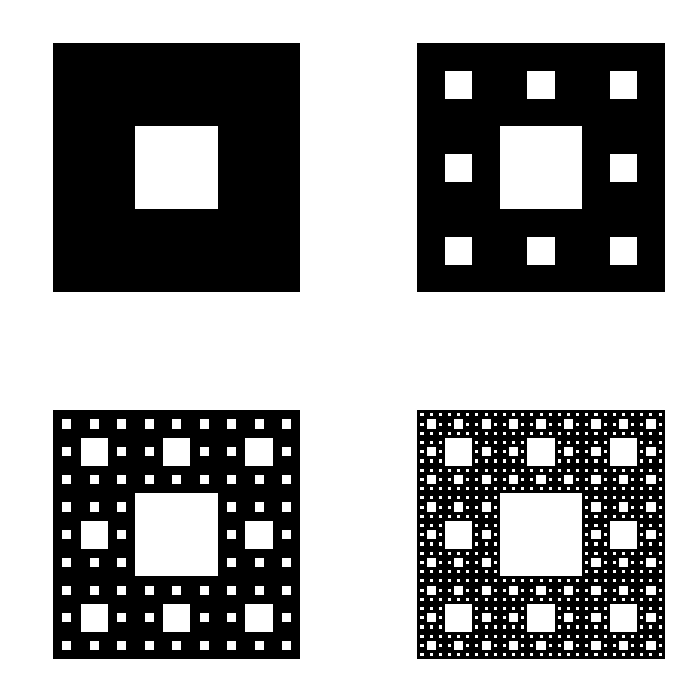 Conway’s “Game of Life” algorithm on an 8 by 8 grid. In this model, cells persist and propagate according to how many neighbours they have (including perpendicular and diagonal neighbours). A cell persists if it has either 2 or 3 neighbours, and empty cells become occupied if they have exactly 3 neighbours. This set of rules might be thought of as mimicking a single species population with density-related effects. Note that, in the final stable distribution shown in Figure 1, each green square is adjacent to either 2 or 3 other green squares. #An implementation of J.H. Conway’s ‘Game of Life’ algorithm.